Pope Francis arrived in Washington, D.C., Tuesday afternoon, and road closures in the city began even before his arrival. Massachusetts Avenue, the busy road outside the Vatican's Apostolic Nunciature, or embassy, closed at 9 a.m. Tuesday. A portion of the street will be closed through the pope's visit. 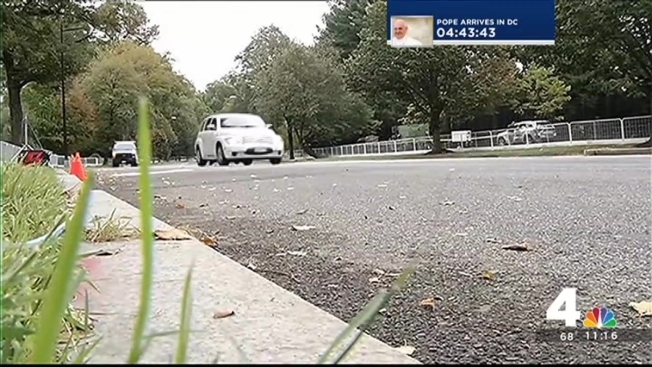 Pope Francis landed at Joint Base Andrews at 4 p.m. Rolling road closures preceded the presidential motorcade out to Joint Base Andrews, and will preceded the motorcade back to Washington. Massachusetts Avenue NW between Observatory Circle South and 34th Place NW will be closed to all northbound traffic. Southbound traffic will be permitted between 34th Street NW and Waterside Drive NW.